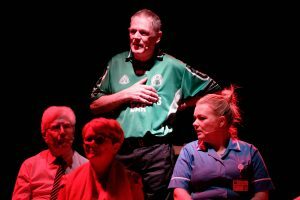 A Friday night at the Brian Friel Theatre. The audience, a full house, take to their feet and erupt into thunderous applause. Emotion is palpable as a man in the front row takes to the stage to embrace his father. Eleven individuals link arms and take a modest bow. 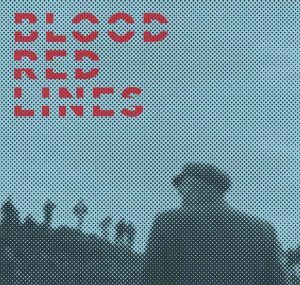 The title of the piece, Blood Red Lines, is a stark reminder of a history of violence, division and distrust. 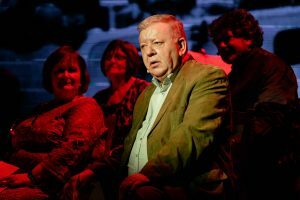 The eleven personal testimonies shared, are revealing of the devastating, far reaching and long-lasting impact of The Troubles. The linked arms are a symbol of collective hope and progress. 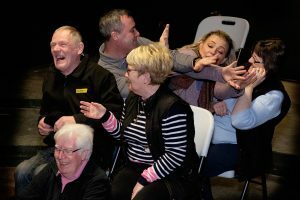 Twenty-one years on from the signing of the Good Friday Agreement and the end of the conflict in Northern Ireland for some, it is now little more than a distant memory, a page in a history book, or a newspaper clipping. But for the eleven victims and survivors on stage and many others besides, the events endured — as well as the subsequent misrepresentation in the media and refusal of those responsible to share the truth and acknowledge responsibility — make committing the country’s traumatic past to memory less straightforward. In a country with no functioning assembly, no state mechanism to deal with the past, and no official memorial to the dead, how do families remember their loved ones? How do victims process their trauma? And how is a shared narrative to educate future generations formed? 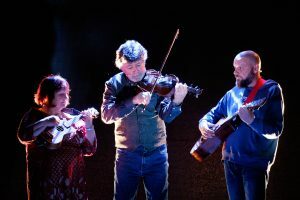 Northern Ireland has grown to become a rich cultural landscape where contemporary music, art, film, and theatre often reflects on and responds to the conflict, engaging with questions of; memory, history, testimony, witnessing, conflict transformation, commemoration, and the politics of reconciliation. The Theatre Peacebuilding Academy produces art that opens up a dialogue on these difficult themes, using drama and art as a means of healing. 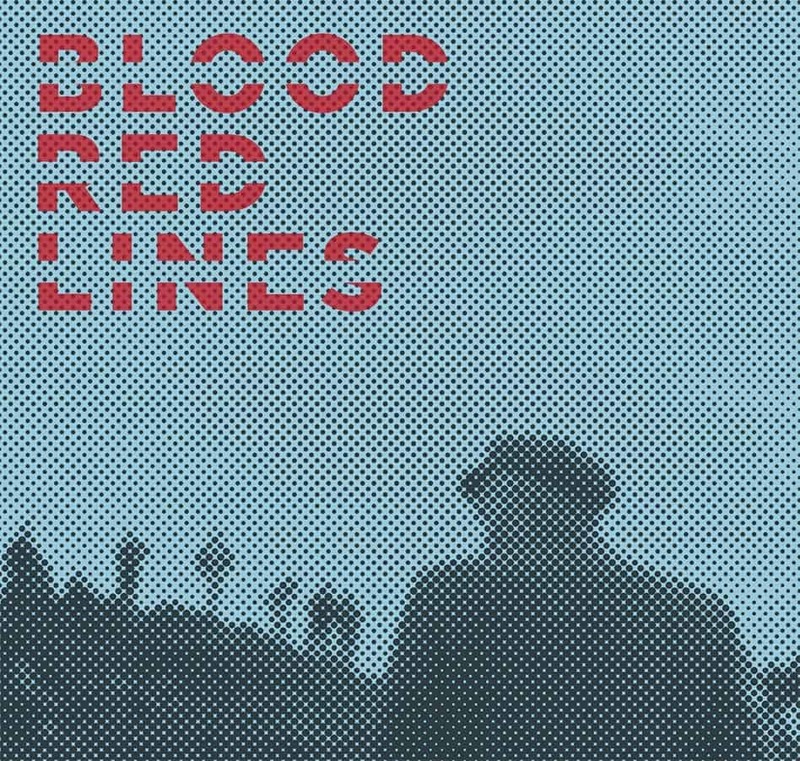 Blood Red Lines, devised and directed by BAFTA winning film and theatre director Robert Rae, saw a continuation of this powerful theme. 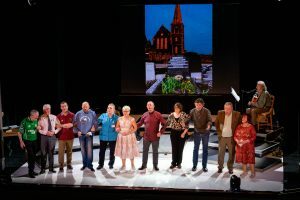 Eleven individuals from both sides of the community and the border, as well an ex-soldier, bravely shared their personal narratives alongside one another on stage. The result is a highly emotive and truly significant piece of contemporary theatre. Public “performance” of memory is not a new concept. On a global scale, transformative justice efforts in post-conflict, post-colonial societies, such as the Gacaca Courts in Rwanda and the Truth and Reconciliation Committee in South Africa, have demonstrated the vital role that sharing one’s personal narrative plays in the foundation of a peaceful society. A full, public, state commissioned community justice system has never been successfully established here in Northern Ireland and as a result, many victims and their families have yet to have their voice heard. Survivors feel let down by the state and disillusioned by the traditional justice system. 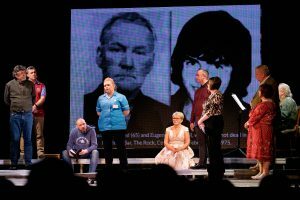 In allowing individuals from all sides to stand on stage together and speak for themselves, Blood Red Lines has empowered and connected survivors and demonstrated the potential of verbatim theatre to function as a form of restorative justice, bringing about healing at both an individual and community level. Production and cast of Blood Red Lines. 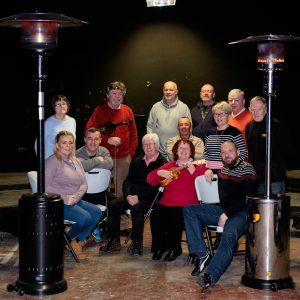 Robert, Pauline Ross (Director and Founder of the Playhouse) and Carol Lamond (Senior Psychotherapist) consider the role of theatre in post Conflict situations and ask is it Art or Therapy? Link to article here.